FILE - Demonstrators march demanding respect for Mexico and its migrants, in the face of perceived hostility from the administration of U.S. President Donald Trump, in Mexico City, Feb 12, 2017. Mexico reacted with anger Wednesday to what one official called "hostile" new U.S. immigration guidelines as senior Trump administration envoys began arriving in Mexico City for talks on the volatile issue. The U.S. Department of Homeland Security unveiled plans Tuesday to consider almost all illegal immigrants subject to deportation, and will seek to send many of them to Mexico if they entered the United States from there, regardless of nationality. The tension over the timing of the rules mirrors an outcry when President Donald Trump tweeted that Mexico should pay for his planned border wall shortly before Mexican President Enrique Pena Nieto was due at a Washington summit in January. Trump, who took office last month, campaigned on a pledge to get tougher on the estimated 11 million illegal immigrants in the United States, playing on fears of violent crime while promising to build the wall and stop potential terrorists from entering the country. U.S. Secretary of State Rex Tillerson, center, is welcomed by U.S. Ambassador to Mexico Roberta Jacobson, right, and Mauricio Ibarra Ponce de Leon, North America director with Mexico's Foreign Ministry, as he arrives at the airport in Mexico City, Feb. 22, 2017. 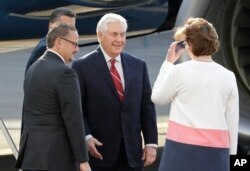 U.S. Secretary of State Rex Tillerson landed in Mexico City on Wednesday afternoon. He was due to be joined by Homeland Security Secretary John Kelly later for talks the White House said would "walk through" the implementation of Trump's immigration orders. Kelly signed the guidelines issued by his department Monday. Mexico's lead negotiator with the Trump administration, Foreign Minister Luis Videgaray, said there was no way Mexico would accept the new rules, which among other things seek to deport non-Mexicans to Mexico. He said the issue would dominate the talks, taking place Wednesday and Thursday. Mexico will insist that the United States proves the nationality of any person it wants to deport to Mexico, he said. "We also have control of our borders and we will exercise it fully," he said. White House spokesman Sean Spicer described U.S.-Mexico ties as healthy and robust and said he expected a "great discussion." Homeland Security's guidance to immigration agents is part of a broader border security and immigration enforcement plan in executive orders that the Republican president signed on Jan. 25. In Guatemala on Wednesday, Kelly told Guatemalans the immigration crackdown ordered by Trump meant undocumented immigrants would be caught and sent back quickly, advising them to stay at home. He denied the administration was embarking on mass deportations. Mexico's agenda at the talks on Thursday includes border infrastructure, deportation strategies, Central American migration, narcotics, arms trafficking and terrorism, and the North American Free Trade Agreement, a senior official with direct knowledge of the matter told Reuters.